Our Wear Valley & Darlington Branch is looking after a kitten rescued from a gang of teenagers who tried to drown him in engine oil. 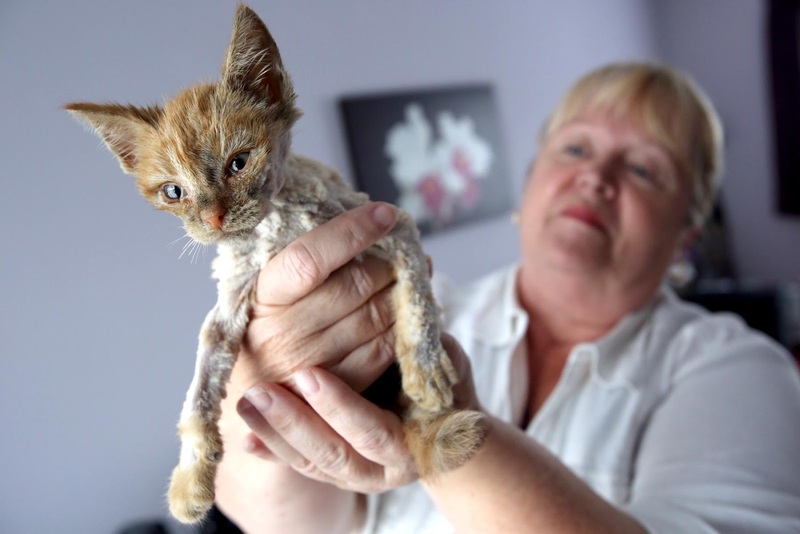 Ginger Chester, who is around seven weeks old, was saved by a passer-by who spotted the kitten being doused in the toxic substance on 30 July. Chester was taken to the vets for treatment and to be cleaned up – some of his fur was so soaked with oil that it had to be trimmed. ﻿He’s now being cared for by the branch, is on antibiotics and – while he still sounds a little raspy from swallowing some of the oil – has been steadily improving. While it’s too soon to say for certain, the branch hopes Chester will make a full recovery and go on to find a loving new home. To support the cats and kittens in our care, just click here. Thank you! Thank you cats protection,for saving a poor cat like that. There are no words to describe what I would do to that gang if I could. There is no excuse for cruelty like this. None at all. Some people honestly don't deserve to walk this earth. Get well soon little fella. Thanks to all who are taking care of him. This is precisely why I donate to CP.....many of the other so called charities would have just put the poor little fella to sleep. As for the people that did this to him, well let's hope karma does its thing! How can any decent human do this? There are too many cruel folk in this world who are basically bullies. It saddens me to hear of such stories. I wish poor little Chester a long and happy life - he deserves it. Decent human's don't do this. These are thugs and murders in training! Good luck little fella! You are in good hands now. Thanks CPL that's why my money goes to you. I hope that karma deals with these pieces of s***. Or somebody gives them up to the law. Would the law do anything? Give them to US, the animal lovers!...CPL, a wonderful charity! I hope those teenagers have been prosecuted! Pure evil! I have been watching your posts ever since Chester came into your Protection. I love Chester. I'm sure he will find a great home. I will miss seeing your daily posts and videos of him. Love & Hugs Chester <3. Hope this cute little fellow is getting better. I'm so happy someone was there to save him. Thank you for what you do ! I have/had twin cats (one died last year at age 9) which I got from my local Cat's Protection. They were (and one still is) the most adorable cats I've ever had. For their lives, for my remaining cat, for Chester and for all the cats you save, THANK YOU! Have these been prosecuted for this.